Loopback Analytics, a pioneer in health care data integration and analytics solutions that streamline care transitions and patient population management, today unveiled its new Loopback Geographic Analysis Dashboard, an interactive analytics tool that allows hospitals to visually assess the quality of post-acute providers in their geographic region. 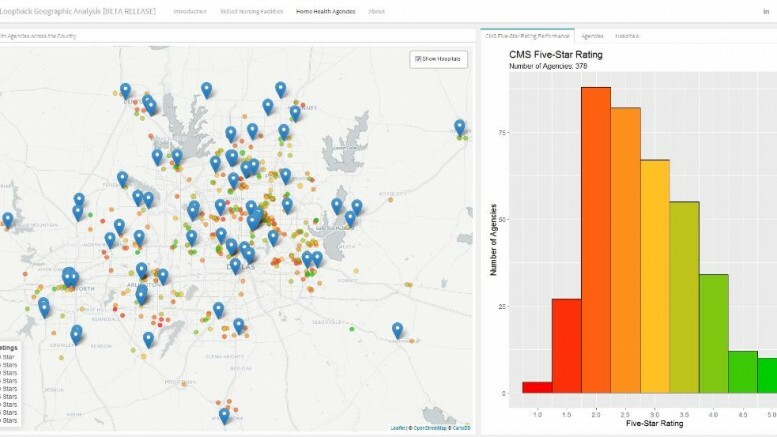 With simple ranking criteria, color-coded quality indicators and an interactive map, hospitals can easily see, at-a-glance, which skilled nursing and home health care providers in their local/regional networks and beyond deliver the highest in quality and efficient care to ensure the best possible patient outcomes. The dashboard is free, open to the public and easy to access at https://loopback.shinyapps.io/Loopback_Geographic_Analysis/. As reimbursements shift from fee-for-service to outcomes-based and new bundled payment arrangements rapidly emerge, hospitals are increasingly at financial risk for post-discharge patient outcomes. That means hospital care coordinators need accurate, data-driven insights into the quality and performance of their post-acute network partners in order to ensure maximum reimbursements and avoid penalties. This dynamic visualization tool gives care coordinators and post-acute network managers a way to get an initial, high-level view of network quality. The data, sourced from the Centers for Medicare & Medicaid Services (CMS) five-star quality system, is presented in an interactive map that makes it far simpler to navigate and digest than most currently available formats. The dashboard is designed to bring transparency into the health care marketplace, providing an easy, innovative and elegant way to help hospitals refine and better manage their post-acute networks. Loopback has opted to provide it free of charge to facilitate improvement and enhance performance across the country. To learn more about the Loopback Geographic Analysis Dashboard, and its care management and data integration platform, visitwww.loopbackanalytics.com.